According to the BHA, Thursday’s meeting has been moved to the Ingersoll Houses Community Center at 177 Myrtle Avenue at the corner of Prince Street. The meeting will begin at 6:30 and doors open at 5:30 PM. Thank you! Does anyone (else) think this is aimed at causing confusion / lowering attendance? Who changed the sight of the meeting? Is there any explanation as to reason for the last minute change? I guess when they tell us to jump … the response they’re expecting is … how high? I would agree. seems pretty shady ! Very shady. And seems to violate notice requirements for public meetings. Please spread word of the new location to everyone you meet and let’s all email our buildings! These people are unable to even plan a meeting. Are you really willing to trust them with a plan as convoluted as what they’re proposing? Stop the madness now. This is not going to happen. I agree. Any chance we can find a volunteer to wait at the original location and poll the number of people who can’t arrive due to the change? Excellent. We are in the early stages of organizing as well and need to coordinate our efforts with yours. Lets meet in the back row of the auditorium when the doors open tomorrow. Hi! Absolutely want to coordinate; want to start getting all interested parties collected on one email list / group. Will be there tomorrow, probably handing out flyers. Excellent. Someone put up a change.org petition as well. We need to coordinate our collective message. See you at 5:30. 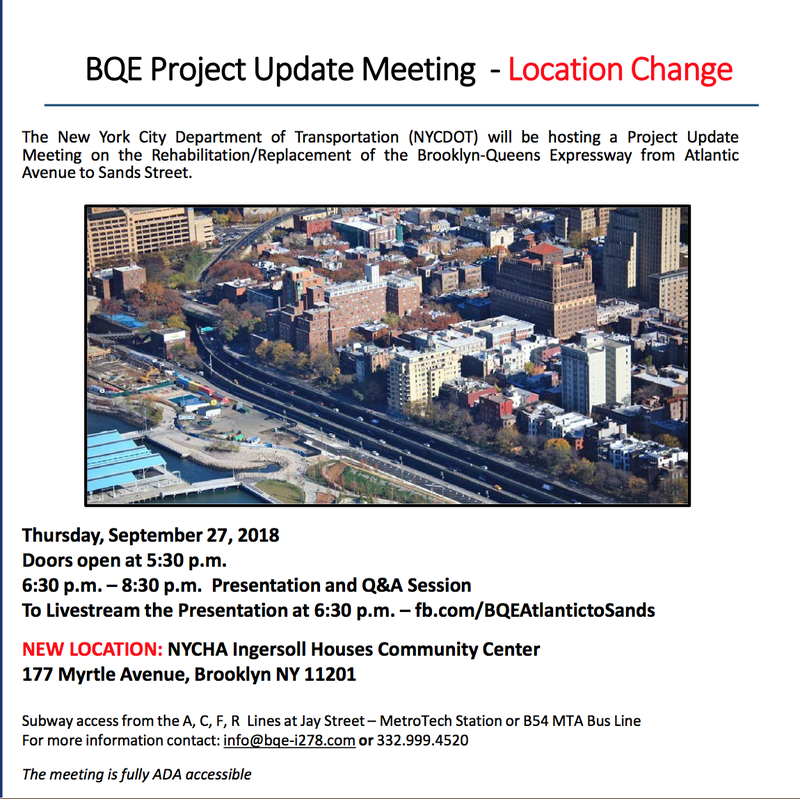 The Department of Transportation (DOT) became aware of the increased (relative to the three previous presentations) interest in the project and decided that it was preferable to change the meeting location on short notice than to turn away large numbers of people from an auditorium that might be too small. Prior to reserving the space at National Grid, DOT attempted to book a larger auditorium closer to the Triple Cantilever but was not able to. (Community Board 2 has found it increasingly difficult to find space for the eight meetings it holds each month, September-June.) So, no, I do not think the change in venue “is aimed at causing confusion / lowering attendance,” exactly the opposite. Individuals who find the Ingersoll Community Center too far away or too difficult to get to may (access to and comfort with technology permitting) livestream the meeting at https://bqe-i278.com/en/get-involved/meetings3. In the past, presentations on the project have been posted to the project website and I have no reason to believe that will not occur after this evening’s session. They should learn from this. Plan far in advance for a very large and vocal turnout! This venue is too far away. St Francis College comes to mind. I’m sure there are other alternatives. I would hope they would post a video of the entire event, not just the presentation they display. I want to hear the audience questions and their answers as well. How would Columbia Heights be “sacrificed”? Is this to suggest that the plan includes a municipal taking of the street? I haven’t seen that reported yet (but entirely possible I missed it). Thanks. i think that’s a reference to the the suggestion in this article (http://gothamist.com/2018/09/24/bqe_crumbling_photos_brooklyn.php#photo-1) that it might be necessary to relocate resident on Columbia Heights and Cranberry during construction. Chapin playground might be impacted by an on-ramp I think but i’m not sure where that’s been reported on, maybe just supposition on message boards. Thanks. Yes, certainly can’t have kids essentially playing on the highway. DOT looked for space at several locations, including St. Francis College. They need to try harder and start earlier. I was at the whole thing but didn’t transcribe. Room was packed. I’d estimate 400 people. People turned away. Also was confirmed that some couldn’t make it because of the venue change. Community input was well represented. I think we should have a new blog post to discuss. The highway would have to Cross Columbia Heights right in front of Chapin playground. So there would be no car or pedestrian access to Dumbo unless you headed over to Henry Street or Cadman Plaza. i think we need to not focus on the promenade as a lovely place to stroll but rather the environmental and community impacts of a 6 lane highway in a very residential neighborhood. I left a meeting with my boss early to make it by 6:30. I got to National Grid at 6;33 or so. the doors were locked. i buzzed and was let in my security who said the venue had changed but he didn’t know where. he said there were signs and people down there. there were not. instead of waiting at least until 7pm as ppl are likely to show up late or, at a bare minimum, leaving a sign and informing the guard, they were gone by 6:33. the room was packed they stopped letting people in. it was a gym acoustics sucked so ppl in the back were straining to hear. However, i clearly heard the most salient part. A great solution proposed by several is to run it over Brooklyn Bridge Park. It makes sense Their response? Protect Brooklyn Bridge park for the visitors and they have no control over BBP. Speaks to their priorities and laziness. It is ok to destroy a community and displace its residents but not Ok to limit the use of a park by randoms who don’t live there. Talking to BBP was also too much work apparently. They just shrugged and moved on to ridiculous “solutions.” They knew about the state of the BQE when the park was being built. They could have done the work then. They didn’t. Now they want to throw this albatross on out backs while protecting motorists and park visitors. Please commit to fighting this. We cannot lay down for this and if we do, it needs to be in the middle of the Promenade right before they plan to demolish it. If anyone missed the meeting, full live stream can be found here. Chapin playground is actually sitting on top of the Columbia Heights Bridge that also needs to be replaced. So that whole section of Columbia Heights will be demolished and rebuilt. I expect to be attacked for posting this, but while it will be a burden to our neighborhood to lose access to the promenade or have the BQE repaired over the course of between six years and nearly a decade (during which vehicles will most assuredly pass thru our streets—trucks use Hicks routinely now when the BQE is congested), the much greater burden and risk would be if these issues with the structural integrity of the BQE were not addressed, which seems to be the preference of the neighborhood’s property owners and some (vocal) portion of our residents. I didn’t really get that take. Most of the ire I sensed was specifically about the elevated highway proposal and the perception that DOT prefers that over all other strategies. 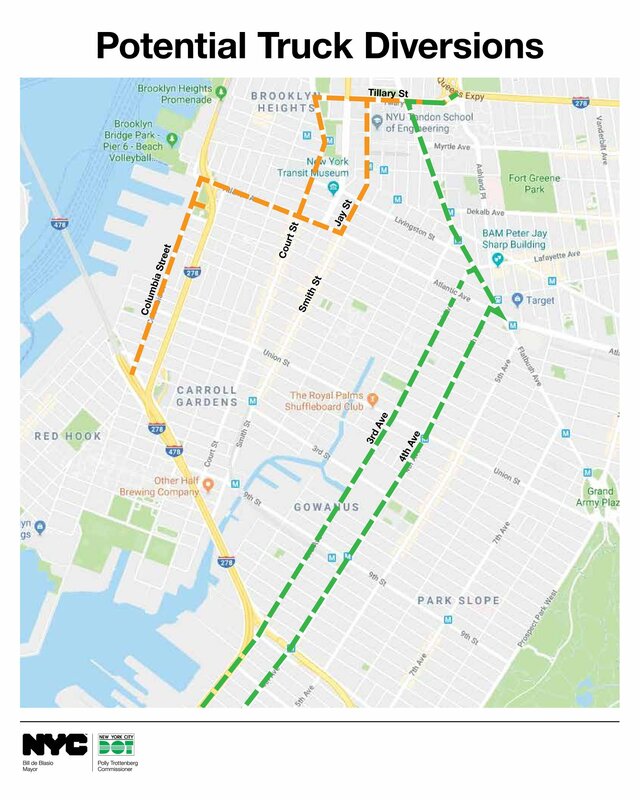 1 The current BQE structure must be replaced or destroyed. 2 Since the promenade is a part of that structure it must also be replaced, somehow. I’d also like to emphasize both the DOT’s and residents’ points that this goes beyond the promenade. Willowtown and the Heights/DUMBO boundary zone will also be affected. In some ways they pose even more difficult problems.